No, I’m not picking on the Spanish Empire here just because my September 10 topic is another of their failed North American settlements. Specifically the Jesuit Ajacán Mission (also spelled in various other ways heavy on “x”s like Axacam or Xacan) to bring Christianity to the aboriginals of Virginia. Which did go very badly. What was meant to be St. Mary’s Mission was founded on September 10, 1570 on or near the Virginia Peninsula where Jamestown would be established 37 years later. Nobody is entirely sure where because, well, they were slaughtered. The founder, Father Juan Bautista de Segura, was determined to found a mission without a military garrison, which made his superiors nervous. But they let him anyway, and he landed with another priest, six Jesuit brothers, a Spanish servant boy, and one “Don Luis de Velasco,” a local of Virginia who had been kidnapped in 1561 and apparently converted to Christianity, constructing a small hut with a room for Mass. Very little is known about “Don Luis” including his original name. And there are people who think he was actually Opechancanough, half-brother or other close relative of Pocahontas’ father Powhatan and a vehement, violent opponent of European settlement in the area. But we do know that whoever “Don Luis” was, he soon left the Jesuit settlement to live with relatives he had apparently located. The Jesuits were worried at having lost their guide and translator. 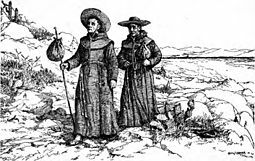 And though they managed to cope, bartering for food, at some point around February 1571 three of the Jesuits went to the village where they thought he was staying. He had them killed, and took other warriors to the mission and killed everyone but the servant boy who they took with them, and stole their stuff. A Spanish supply ship showed up in 1572 and was attacked by locals dressed in the captured clerical garb. The attack failed and captives told them the servant boy was still alive. They traded some of their prisoners for him and he told them about the massacre. The Spanish later sent a punitive expedition that couldn’t find “Don Luis” but did kill a few dozen people and then left. What are we to make of this? The Jesuits may not have been very welcome. But they don’t seem to have taken the land they settled on by force, nor do they appear to have converted anyone by force. On the other hand, Don Luis could justly complain of his treatment by other Spaniards and if he warned his friends and relatives that European settlement would be bad for them he was not mistaken. Does that justify treachery and murder? I don’t think it does, especially without first telling the Jesuits to leave or die and with the Jesuits deliberately showing up unarmed. And once again it indicates that the PC version of the collision between Europe and America is sanitized to the point of dishonesty when it comes to the locals, and particularly their chronic low-intensity warfare, which was not very lethal only because their weapons were not very effective. They didn’t just do this sort of thing to the white-skinned strangers. They did it to one another, relentlessly. I do not know what advice you would have given the locals in Virginia in 1570 when the Jesuits arrived. But even knowing what you know now about the long-term consequences for aboriginals of European contact, would you have said slaughter them without warning? If not, can you really excuse their doing so, especially since they did not know then what you know now?